12 of our best-loved chocolates, hand-picked to say ‘happy birthday’ in the most blissful way – with something for everybody to love. Whether they’re fans of every kind of chocolate or you’re not sure where their heart lies, wishing them many happy returns is simple with this selection of some of our most popular recipes. 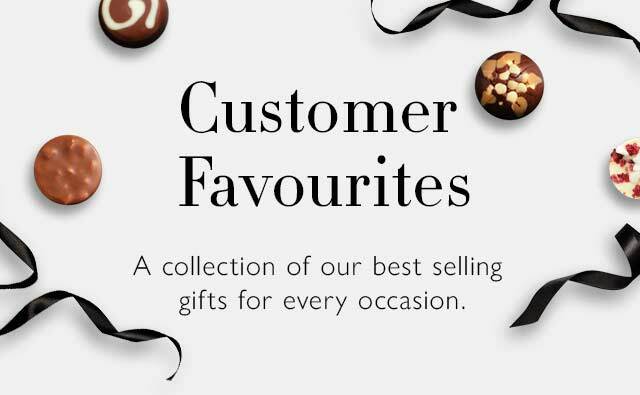 This year, treat them to velvety-smooth pralines and classic desserts reinterpreted by our chocolatiers – all wrapped up in elegant typography for a simply-chic birthday gift. 145.00 g / 5.10 oz. Ingredients: cocoa solids (cocoa mass, cocoa butter), sugar, full cream MILK powder, sweetened hazelnut paste (HAZELNUTS, sugar, emulsifier (sunflower lecithin)), HAZELNUT paste, stabilisers (sorbitol, glycerol), sticky toffee sauce (sugar, cream (from MILK), butter (from MILK), flavouring), butter oil (from MILK), glucose syrup, whipping cream (cream (from MILK), stabiliser (carrageenan)), skimmed MILK powder, whole MILK, shortcake biscuits (wheat flour (WHEAT flour, calcium, iron, niacin, thiamin), non-hydrogenated vegetable fats (palm, shea, rapeseed), sugar, invert sugar syrup, tapioca starch, salt, raising agents (sodium bicarbonate, ammonium bicarbonate), emulsifier (sunflower lecithin)), dextrose, fruit juice concentrate (raspberry), emulsifiers (SOYA lecithin, sunflower lecithin), chocolate coated cereals (crisped rice (rice flour, sugar, cocoa butter, salt), sugar, cocoa mass, cocoa butter, whole MILK powder, whey powder (from MILK), butter oil (from MILK), vegetable fat (coconut), glazing agents (gum arabic), glucose syrup, modified starch (potato, maize), emulsifier (SOYA lecithin), flavouring, spices), freeze dried raspberry powder, freeze dried raspberry pieces, flavourings, caramelised sugar, acidity regulator (citric acid), vanilla seeds, natural colours (paprika, annatto).